Upon firing up Manual Samuel – a game which released on other platforms back in 2016 – you’re immediately informed by the cod-British narrator that Sam is a total brat. An ultra-privileged upbringing has created a man with zero empathy who lacks the most basic social graces. His douchebaggery leads to a concussion that disrupts control of his locomotive faculties; pushing ‘ZR’ and ‘ZL’ in turn operates his legs and gets him walking, but his lack of coordination soon lands him very literally on Death’s doorstep. Death – a wannabe-skater obsessed with landing a kickflip – proposes a deal: if Sam can survive 24 hours with a handicap of Death’s choosing, he’ll be permanently resurrected. If not, the reaper will skim Sam’s ‘shreds of life’ (Hell’s most valuable currency) into his personal savings. Back in the mortal realm, Sam must survive a normal working day by performing automatic bodily functions manually. In addition to each leg, this includes hand movements (‘L’ and ‘R’), inhaling and exhaling (‘Y’ and ‘A’ respectively) and blinking (‘B’). His spine has a tendency to give out, too, and hitting ‘Up’ on the D-buttons or, alternatively, flicking the Joy-Con upwards gets him back upright. With strong echoes of Octodad, the absurdity produces hilarious results. Fail to blink and the screen gets hazy; forget to breathe and Sam’s face turns blue. Get a rhythm going and his spine will suddenly go limp, or he’ll do an impromptu splits, squirming on the floor as the narrator drops a withering bon mot. The narrator tracks your actions well and comments appropriately, even when you skip cutscenes. Hashtags accompany many accomplishments, flashing up onscreen whether you manage to pull your trousers on (#WearPants), clean your teeth (#CleanTeeth) or head off the critical path (#Explorer). Things soon get more complicated than simple respiration. A procedure like drinking a glass of water, for example, involves holding down a shoulder button to grip a cup from the dispenser, then hitting ‘X’ as an arrow slides back-and-forth across a meter to deposit the liquid successfully into Sam’s mouth before finally swallowing. 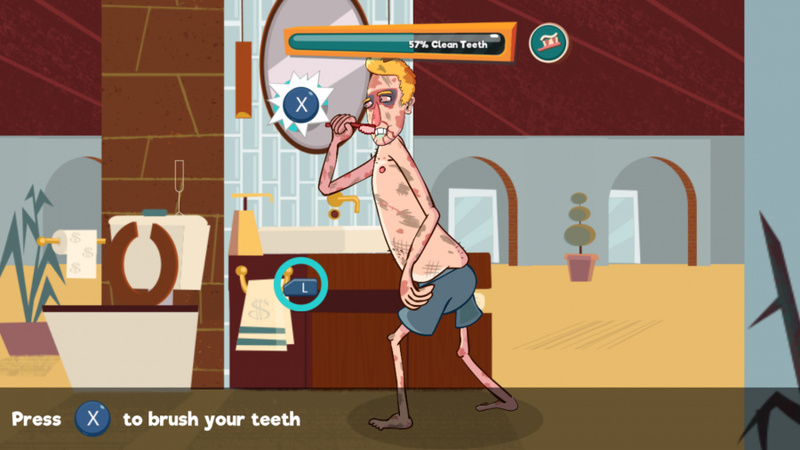 Onscreen button prompts direct you (these can be turned off in Options) but failure at any point – from throwing the drink in your eye to accidentally inhaling rather than swallowing – will result in Sam’s collapse into a blinking, choking mess. While fun, developer Perfectly Paranormal knows that the premise has limits. Consequently, you’re not punished for failure beyond repeating the immediate task you’re attempting. After leaving Sam’s house, within a couple of hours you’ll have negotiated several other nightmare scenarios including driving (with manual transmission, naturally), speaking to colleagues and operating machinery. Death’s tomfoolery soon creates other problems – time to brush up on your mech piloting skills! You’ll soon discover Hell has a hierarchy and the reaper isn’t top dog. The visuals won’t blow your socks off, but the Chuck Jones-esque backgrounds work well with the clean animation. Echoes of Danny Elfman punctuate the soundtrack and the voice work is effective. If you fancy sharing the experience, Co-op mode spreads control across two Joy-Cons. Coordinating your actions just to keep Sam breathing is challenging, and surprisingly satisfying provided you have a capable, communicative companion. Completing each of the eight Story chapters unlocks Time Attack mode. Rounding out the package is an Achievements list and a selection of Life 4 Death comics featuring Death. While these are nice additions, they’re unlikely to add hours to your playtime. Without achievement hunting, the average player will probably see everything Man Sam (as nobody is calling it) has to offer in two-to-three hours. Some may look at those numbers and balk, but it’s refreshing to see a developer confident enough to not bloat the game with filler; it wisely doesn’t outstay its welcome. There are plenty of alternatives on the eShop if you’re after more bang (read: playtime) for your buck, but in a world with more games than most of us have time to play, we’d rather have a considered, concentrated experience that puts a real smile on our face for its duration than the same thing spread thinly over ten hours. 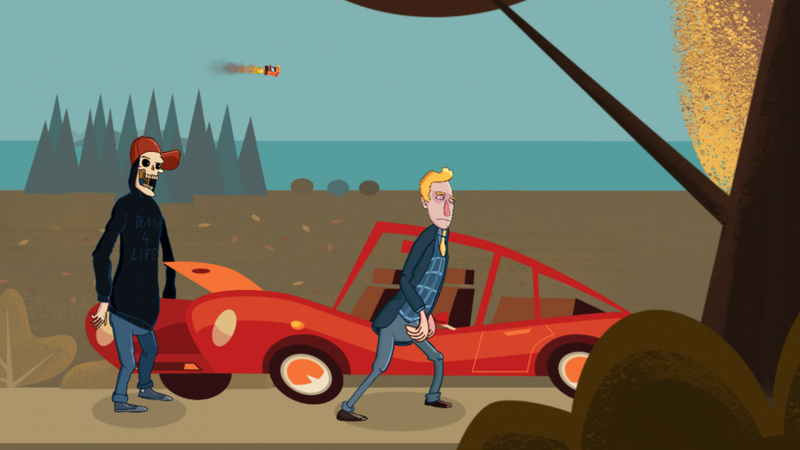 While it’s not going to set your world alight with flashy features or ground-breaking mechanics, we enjoyed our time with Manual Samuel enormously. The joke risks wearing thin, but Sam’s adventure is brief and self-aware enough to hold your interest. Co-op play is surprisingly fun with a willing accomplice and Time Attack offers some longevity, although for most players it’ll be a short ‘one-and-done’ affair. For our money, it’s a pleasant amuse-bouche of a game – a welcome little treat between the larger courses being served up on Switch this summer. It would be interesting to know how much, if anything, has changed since your sister site Push Square gave it 4/10 in 2016, or whether this is just a case of different reviewers having different tastes. "makes it difficult to enjoy the best bits without feeling guilty for laughing at something you feel like you really shouldn't." "in a world with more games than most of us have time to play, we’d rather have a considered, concentrated experience that puts a real smile on our face for its duration than the same thing spread thinly over ten hours." Those are the kinds of words I like to hear these days. Man, I WISH I could find ten hours to dedicate to a game. 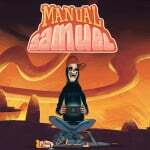 One of the best indie games in recent history in my opinion. If this drops to the $5 range I will give it a go someday. I like what I am reading in the review, but $10 is just too much for this short of an experience for me. I like a difficult game, but this just seems stressful.